Seen at Welshpool in May, running around her train in readiness for the return leg to Llanfair Caereinion, 'Joan'is a 1927 Kerr Stuart tank built for use on sugar estates in Antigua. She commenced service on the W&L in 1977. Notwithstanding the fact that we are now a large club, we strive to keep bureaucracy to an absolute minimum. This month however, along with the rest of Europe [and there's no political comment there], changes in the law relating to the management of personal information have rather set the regulatory cat amongst the electronic pigeons. This will affect all of you, one way or another, and the implications of these changes, and the requirement which drives them, are explained fully below. They are, I'm afraid, unavoidable for us. Also covered this month is an update on the Test Tracks, a note about a new private-owner Swansea van and advance notice about the next stock sale. With the boards installed and painted, you will have noticed that track laying has commenced and the outer O gauge circuit has now been temporarily wired to allow for running. It was always hoped that the entire project would be completed during May, although that was dependant upon sufficient members being able to assist throughout the month. Realistically however, the arduous job of laying hundreds of feet of track is likely to see completion pushed back into June now, although the more who can assist Mal Rowe and his team with this task should bring the end date closer. Please speak to any of those involved in track laying directly at the Club if you feel you are able to assist. The sooner the Test tracks are finished, the sooner they will be available for use: it's in all of your interests to avoid further delays! Finally, whilst most of the new electronics have been sourced, the control panel area will take a while to construct and install. In order that that does not create any further delays, Mal Rowe has advised that temporary controllers will be utilised to enable running once all of the tracks are in place. A lot of Club members have assisted in this project so far, and I'd like to thank Mal Rowe, Steve Giffard, Mal Shore, David Williams, Chris Zajac and John Mages particularly but also Roger Bowen, Nathan Taylor and Lyn Davies for their involvement. If I've omitted anyone, many, many apologies [and do let me know]. This new regulation has become somewhat burdensome and many of you will be aware of it as a consequence of e-mails which you have already received from various organisations or businesses that you have had dealings with on-line. Essentially however, it exists to protect you and the information which you have given to the Club to help assist in administering your membership. '...The Swansea Railway Modellers' Group takes your privacy seriously. The information and details supplied by you on joining the Club, whether an e-mail address, a postal address, a phone number, a photograph, social media or any other form of contact, is held electronically and in hard copy but is used solely to administer your membership and is never shared with any thirdparty without your consent or used for any external commercial purpose. If you pay your monthly subscription by standing order, your name will also appear on the relevant Club bank statement, each month, to confirm that your payment has gone through. These details are seen by the Treasurer and Officers only. This is the only personal information that is stored about you and none of this is ever made public. Monthly newsletters or other occasional widely distributed documents will always be sent 'bcc' in order that your e-mail addresses remain confidential. For those who receive these updates through the post, your postal addresses remain confidential also. As a member of the Club, by signing a consent form, you agree that we may keep the information you have supplied in electronic or hard copy form only for the intended purpose as stated above. If this is not acceptable to you, and you wish for your details to be deleted from the electronic or hard copy databases, you should decline to sign this form but please advise that you have done so. The consent form referred to has already been signed by a number of members and others, who do not attend frequently [or are traders / other clubs / ex-members who wish to keep in touch] have been contacted by e-mail in the same vein. Consent forms will continue to be available at the club during coming weeks. Please ask for one if you have not already been given one. and outings and other information relevant to your membership or interest in the club: consequently, it is in your interests to sign up! There are no implications for you in terms of giving consent: it simply means that the Club can continue to use the information that you have provided, but solelyfor the reasons outlined in the Privacy Statement. If you do have any concerns, please contact me directly. The recent April stock sale was extremely successful and many thanks to all who supported it by purchasing items. A very small amount of stock remains unsold and this, together with some more-recently acquired stock will go into a further sale which will probably be held during later June. The new stock includes some very good and quite new N gauge items [both BR-era locos and coaches], a large number of OO coaches [Hornby 'Railroad'-type Teaks and Pullmans, together with some older Hornby and Triang coaches] and an as-yet unspecified OO collection. Not all of these have arrived and I hope to collect them within the next fortnight. All are commission-sales from deceased estates. Further information in due course! Have a look at the recent updates which include an obituary to the Hornby 'Thomas and Friends' collection [in the blog section], details of a new Swansea private-owner van commission [in the products section] and an account of building a set of white-metal LNWR 6-wheel coaches [in the member's projects section]. Once again [although this is becoming disappointingly stony ground], if you have an article or the details of a build which you'd like featured in our website, contact either myself or Gwion Davies. Over the long weekend on the 26th – 28th May, The Gwili Railway is holding a Craft Fair at which we shall have a table to promote the Club and sell our limited edition ‘Tirdonkin’ wagons. This has now been tidied up and a vast amount of rubbish was removed from both it and the Club's store. Many thanks to allwho helped, but particularly Gwion Davies and Scott Rhodes. This facility is used regularly by members who require a quiet, uncluttered place to model. Please ensure that when you have used it, you clear away your materials and leave it in the state in which you found it. If it become necessary to leave projects out during the week, please let me know as there is a risk of them being moved otherwise. 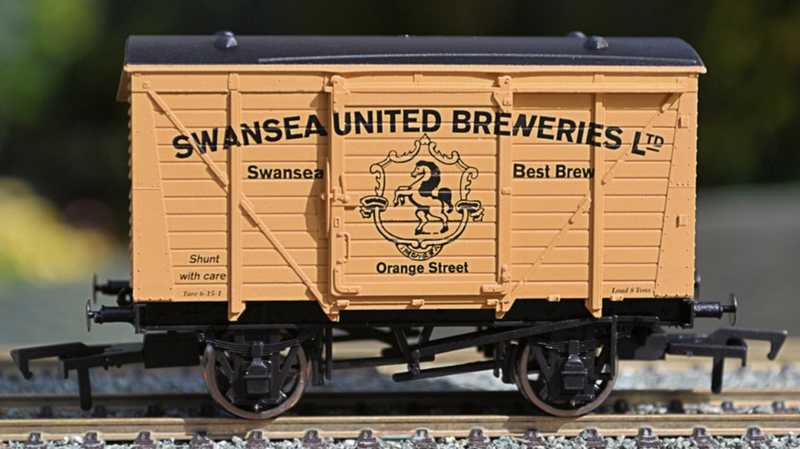 Advanced notice of the Burnham Model Railway Club's 'Swansea United Breweries' van commission was given in the April newsletter. This is now on sale but should also be available at the Burnham team’s stand in our 2018 show. All of the profits from the sale of this commission will be very kindly donated to FOYD – for which, many thanks Burnham. Orange St. still appears on mid-1950s Swansea street plans, you'll see it below, to the left of the bomb-damaged St Mary's Church in the centre and just below the market. A very old photograph of the actual brewery building may also be found in the Club's website at the products section, linked here.